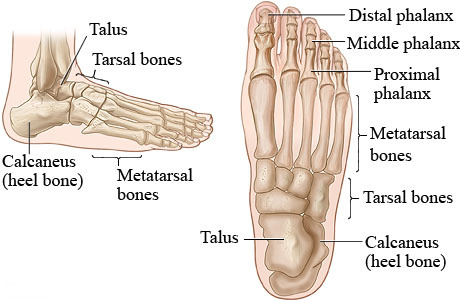 The cuboid bone is one of the seven bones that make up the tarsus, or ankle bones. The distal phalanges of the foot are the small toe bones at the end of each digit. The dorsal tarsometatarsal ligaments are ligaments of the foot. They joins the tarsus to the metatarsal bone. The plantar calcaneonavicular ligament is a ligament in the sole of the feet. It joins the navicular bone in the ankle to the calcaneus, or heel bone. The posterior talofibular ligament is a lower leg and ankle ligament. It joins the lateral malleolus to the ankle, with the help of the anterior talofibular ligament. These ligaments form a prominence on the side of the ankle. The posterior tibiofibular ligament is a lower leg and ankle ligament. It joins the fibula behind the knee. The proximal phalanges of the foot are some of the small bones that make up the skeleton of the toes. Each smaller toe has three phalanges (the big toe has two). The phalange nearest the body of the foot is called the proximal phalange.